A forceful blow to the tip of your finger may cause mallet finger. Talk to your doctor to get proper treatment in terms of the severity of your injury. It is possible to straighten the end joint of your thumb or finger because of a thin tendon in that joint, but sometimes, an injury to the tendon makes it difficult to move that joint. The condition is called mallet finger, which is also referred to as "baseball finger". You may develop a mallet finger if you try to stop a ball or another unyielding object that hits the tip of your finger with great force. 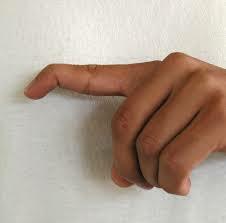 The impact will bend your finger beyond its normal range and makes it difficult for you to straighten it. It is possible to find a treatment, but you have to consider the severity of the injury first. Keep reading to learn more about finding a suitable mallet finger treatment, like using a mallet finger splint, and other measures you can take to accelerate healing. The injury to the outermost joint of your finger is called mallet finger. So many types of accidents can cause an injury to this part of your finger. Sometimes, the impact is so strong that it separates the tendon that's on the back of your finger. Depending upon the impact, the severity of your injury may vary. You may have damaged your tendon but you don't notice any bone cracks or fractures. You may notice a ruptured tendon with a small fracture. Finally, your tendon ruptures with a large fracture. Your doctor will consider the severity of the issue before identifying a suitable mallet finger treatment. It is quite common to see people not seeking any medical advice even though the mallet finger causes serious pain. That's mainly because you can still use the rest of your hand to do different tasks. It is not a good idea though to bear the pain when there are ways to make things more manageable. You should look for certain symptoms to ensure you have a mallet finger, and if that's the case, go talk to your doctor. Some of the most common symptoms include tenderness, pain, and swelling at the affected joint. You may also notice redness after the injury and it will be difficult to extend your finger completely. Don't ignore the injury, especially if you notice blood trapped underneath your nail, which usually means there's a cut in the nail bed – it may also indicate a broken finger bone. If you leave these injuries untreated, you may end up developing an infection. So, be sure to use icepack on your finger to reduce and swelling and keep it elevated before you visit your doctor to ensure it's nothing serious. It is always a good idea to apply ice on the affected area soon after you get injured. If it looks serious, go see your doctor. Your doctor will confirm if you have a mallet finger or not. The diagnosis is usually easy – your doctor will closely examine your finger and notice any redness, swelling, etc. They may also order x-rays to check the extent of injury – this also helps make sure your joint is still aligned. Here's a bit more about mallet finger treatment. Like mentioned already, the first thing you should do after acquiring an injury to your finger is ice the affected area. Icing will help a lot in reducing tenderness and swelling. You can simply wrap ice in a small towel and apply it to your finger. Be sure not to apply ice directly to your skin. Placing a bag of frozen vegetables over the affected area is another good idea. Just make sure you don't aggravate your injury while using icepacks. Also, don't forget to clean the cut if you have one – keep it under running water for a while before you wrap it with a clean cloth. Apply moderate pressure to stop bleeding and then ice it to reduce swelling. You can always take a number of OTC and prescription pain relievers to deal with pain and swelling that's common with mallet finger injuries. Be sure to talk to your doctor before taking any pain relievers if you have pre-existing medical conditions. You may require medical intervention to correct your condition. 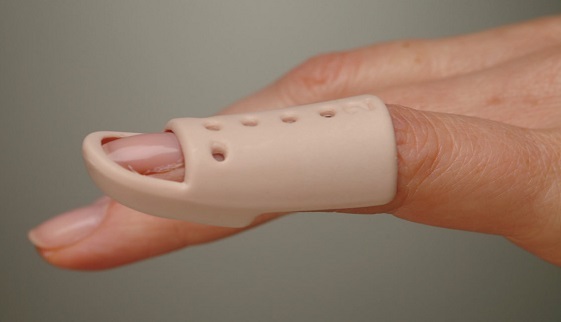 Your doctor will use a mallet finger splint if your finger isn't broken or the fracture is small enough. This will help keep your finger extended. You will have to wear the splint for about 8 weeks continuously to restore function to your affected finger. It means you cannot take it off even when you're bathing or changing clothes. As it dries, it is important to make sure your fingertip doesn't droop at all. It is equally important to keep your fingertip extended when you remove the splint for cleaning. If it droops, you will have to wear the splint for a longer period. It is important to bear in mind that wearing a splint for long will irritate your skin, so you have to examine your skin regularly to notice any issues. Be sure to visit your doctor while you're recovering to ensure everything is on the right line. Your doctor will also help you learn how to perform certain exercises after your mallet finger has healed completely and your splint is no longer required. It is important to tell your doctor to examine the cartilage as well if one of your children has a mallet finger injury. This is to ensure that the finger of your child doesn't deform due to the injury to the cartilage that's associated with bone growth. You may have to undergo a mallet finger surgery if the fracture is large and involves joint damage as well. You have to contact an orthopedic surgeon or a hand specialist to learn the risks involved in surgery. It is important to arrange a follow-up visit after a surgery, especially if you notice any deformity developing in your finger. Why Does Your Neck Crack?